Mezcal roasting. Photo courtesy of Tess Rose Lampert. Mezcal’s popularity just won’t quit, despite nervous chatter about the effect of ever-rising demand on the quality and character of this artisanal spirit. But only a handful of exported mezcal brands have showcased the regional diversity of this beverage—until now. After overcoming significant challenges, mezcal from Durango, Mexico, is making its grand entrance onto the international stage, showcasing serious value as well as new and exciting agave varieties and spirit styles. While nine states make up the official Mezcal Denomination of Origin, exports are still largely dominated by Oaxaca. According to the Consejo Regulador del Mezcal (CRM), Oaxaca produced 85 percent of all DO mezcal in 2017, while the lesser-known state of Durango produced less than 2 percent. It’s rare to see an entire lineup from a state that is not Oaxaca, and only a handful of brands—among them Reyes y Cobardes and Leyenda—offer mezcals from multiple states. But as the CRM fights through growing pains, having only been established in 1994, Durango’s producers, driven by dedication and passion for their abundant natural resources, have banded together to bring their unique mezcals to buyers and consumers across the U.S. This emerging region has hit the ground running and is ready to make its mark. Though producers have been making mezcal in Durango for generations, logistical struggles have prevented the region from having a significant share in the production of DO mezcal. Because any spirit must be certified by the CRM in order to be considered and labeled as mezcal—uncertified “mezcal” is legally called agave distillate, which is not desirable for export—Durango mezcal was severely shortchanged until it got a certifier from the CRM in October 2018 who works only on Durango certifications. Before then, producers had to wait for a Oaxaca-based certifier to make the lengthy car and plane trip to Durango, and they would have to pay the certifier’s travel and hotel expenses on top of standard certification costs. Scott Rosenbaum, a New York–based spirits strategist with T. Edward Wines & Spirits, who imports and distributes Durango’s Lágrimas de Dolores mezcal, and is a SevenFifty Daily contributing editor, says certification difficulties persist. “While theoretically a producer could make certified mezcal in Durango,” he says, “the infrastructure for getting certification was both costly and cumbersome. This barrier to market entry is slightly lower today than it once was, but there are still hurdles.” Though Durango now has its own certifier, it does not yet have a CRM office, which makes the cost of certification much higher than it is in Oaxaca. Another challenge for producers is the frequent illegal sourcing by Jalisco smugglers of Durango agaves for tequila production, a common problem for all mezcal-producing states. According to German Gutiérrez, the president of Espíritus de Durango, an association of Durango mezcal producers established in 2018, this is one of the biggest threats to their industry’s growth. Azael Padilla, the association’s general manager, repeats the concern: “Our agave is illegally used to make tequila, but as it is harvested without any control, the smugglers are seriously damaging the land here, putting us in a high-risk situation.” The most significant consequences of the illegal activity are the disruption in the supply of plants and the high cost of traditional agave varieties that are left for the local producers to buy. The setting of many classic Western movies, Durango feels strangely familiar, with dusty roads and endless mountain vistas. The terrain is rough, generously scattered with giant nopales and yuccas and strewn with volcanic rock. The landscape is markedly different from that of Oaxaca, with more forests and rocky soil. These elements, while seemingly superficial, play a part in the production of the local spirit, particularly in the hornos used to roast the agave. 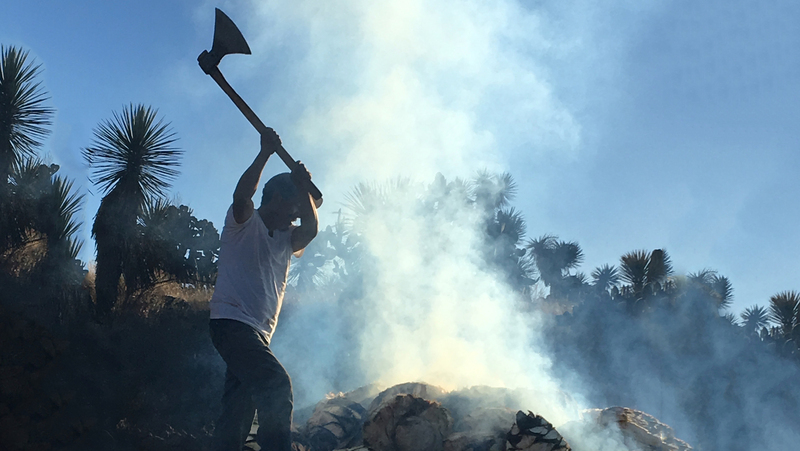 The volcanic rock retains and distributes heat efficiently in these ovens, and the abundance of wood creates a consistency in the resulting mezcal’s flavor. Left: Cenizo nursery. Right: Cenizo. Photos by Tess Rose Lampert. The quality of the hornos is important, as this is where the specialty of Durango is placed after harvest: Cenizo Agave durangensis, often simply called Cenizo, the signature agave variety of the state. Though Oaxaca also grows a variety referred to as Cenizo—which is actually A. karwinskii—durangensis Cenizo is an entirely different species, and it sparks a lot of local pride. “Cenizo is our identity,” says Padilla. 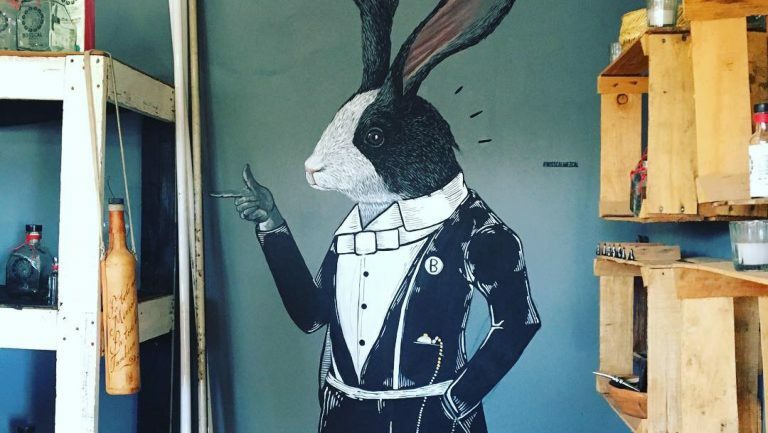 “It makes us different from any other mezcal, since it only grows in Durango. I like to say it is our treasure.” While the flavors vary significantly depending on the season of harvest, this variety tends to produce mezcals that are rich in sweet green flavors, both fruity and earthy with lactic notes. Durangensis Cenizo makes mezcals that pair exceptionally well with chocolate and fruit. But part of the allure of Durango Cenizo is its ability to create mezcals that are never exact replicas of one another. It is a fascinating variety that, unlike most others, is virtually incapable of reproducing by hijuelos, the clonal sprouts of the mother plant’s underground root. The vast majority of Cenizo reproduces from seed, meaning each plant has a unique genetic makeup. Because of this, Cenizo shows great biodiversity, making it a naturally sustainable variety that is still mostly harvested wild. In an effort to stay ahead of the sustainability curve, many brands are starting nurseries for semiwild plants, where baby plants are cared for in a controlled environment before being replanted in their natural habitats. There are infinite hybrids and subvarieties of Cenizo, making each bottle of this mezcal a once-in-a-lifetime micro-batch, with flavors as subtly unique as the plants themselves. 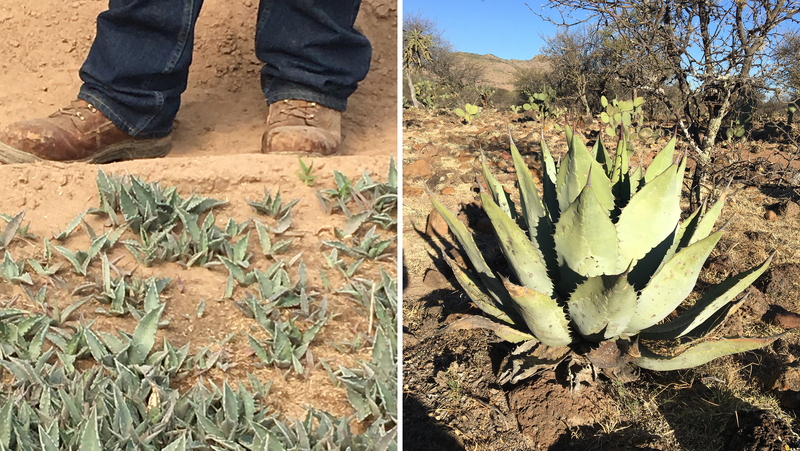 After traveling to Tepehuanes to meet the producer, Gutiérrez walked into the wild agave fields and concluded that the plants weren’t Durango Cenizo. An earlier government-funded project had resulted in the plant being hastily and erroneously labeled as Cenizo. Gutiérrez took steps to properly classify the plant, known locally only as Agave de la Sierra, through the National Polytechnic Institute. After exhaustive effort and documentation, the CRM has accepted this new agave but is still attempting to verify a common name. By continuing to pinpoint and identify new agave varieties, Durango will only widen the diversity of its mezcals. Part of Espíritus de Durango’s work is to communicate the characteristics that set Durango’s mezcals apart from those of other states, especially Oaxaca, which has become the default base of knowledge for the majority of mezcal drinkers. In addition to terrain and agave varieties, there are traditions that are distinctive of each region. Even the particulars of terminology can create confusion; for example, a mezcal production facility is called a palenque in Oaxaca but a vinata in Durango. Another major distinction of production in Durango is the still, which typically features a wooden top, similar to the stills found in other wooded northern regions of Mexico, like Michoacán. The use of wood often yields mezcal that is less smoky, as the wood absorbs some of those flavors. This less smoky profile has become a classic characteristic of Durango mezcal. Bosscal. Photo by Tess Rose Lampert. Even though there are plenty of producers in the state with long family histories, most Durango brands are relatively new to the world of craft mezcal. This has created a community that is open to experimentation, whether to combine the traditions of two regions, like Origen Raíz, or to embrace contemporary trends, like Bosscal, a brand that uses an urban distillery to ferment and distill cooked agave, sometimes even infusing it with CBD. Lágrimas de Dolores, the first brand available in the United States that produces only Durango mezcal, is helmed by a first-generation maestra vinatera, or head distiller—Fabiola Ávila—who just made the brand’s first batch of sotol and a special run of highly coveted pechuga mezcal, created with Dark Matter Coffee. Having hurdled bureaucratic obstacles and formed a network of brands, Durango producers are laying the groundwork for future success. Although there are currently fewer than 10 Durango mezcals from a handful of brands available in the U.S., experts suggest that the region will become a major player within the next three to five years—an evolution that will ultimately benefit mezcal lovers everywhere. Tess Rose Lampert is an agave educator who’s had a lifelong passion for Mexican culture. She has traveled extensively throughout Mexico to learn about agave spirits from the families and communities that produce them and has brought back their knowledge and wisdom to share with other enthusiasts.